Where do the majority of your past clients come from, and how can you use that information to continue nurturing the relationship with them? The answer will differ for every photographer, as your business and ideal client are unique. Though, there is one point that remains the same: creating a plan for marketing to past clients can help you create business and bring in income for years to come. 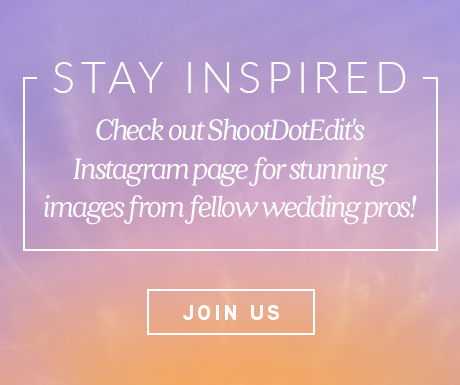 Here at ShootDotEdit, we specialize in editing photography for professional wedding photographers. We also strive to provide educational content and material that will help you and your business grow. Below, we dive into how to create a plan for marketing to past clients that can help you create business after the wedding day. We also dive into the steps needed to create an unforgettable experience for all clients to ensure they will work with you years from now. After months of planning, photographing their engagement session and wedding day, and delivering their products, it can be a relief to finally fulfill all commitments and orders with your clients. Even though your work is over, it doesn’t mean the relationship between you and your clients needs to be. You have worked to make them loyal fans of your business, and it is important you continue to nurture the relationship and continuously market to them. When you remain engaged with your past clients and give them little reminders to talk about you and your business, you can create a strong referral base that continues to bring in clients. The first step is to learn about your past clients. This will help you spend your time efficiently. Rather than marketing in areas you hope you will grab their attention, you can use your efforts in the places you know your past clients are. To start, here are a few ways you can find out where your clients first found out about your wedding photography business. Use Google Analytics. Google Analytics is a tool you can use to learn more about your clients. It allows you to track where a client comes from to access your website and blog. The data you receive can help you make decisions about where you should use your marketing efforts. Provide questionnaires. Include questionnaires for your clients to fill out before and after booking you to let you know how they found out about you. One way to do this is to include the question on the contact form on your website. You can also ask your clients post-booking, especially during the first client planning meeting. When you find out the source of your bookings, you can then begin marketing to past clients. Here are a few ways to market to your past clients. Take the loyalty your clients have for you and continuously nurture it. Re-engage your clients at every point in their lives. The wedding day is just the beginning of the adventures they will experience together. After the wedding, your clients will have a list of to-do’s, from buying a house to having a baby. This is the perfect time to help them out. For example, if you know a real-estate agent, host a night at your studio with them and your clients. This can be just the introduction your clients need to get started on one of the major post-wedding milestones they want to accomplish. When you provide an excellent experience for your clients, from the beginning to after the wedding day, they will continue to want to work with you in the future. Plus, they will be more likely to refer you to others. Wedding Photographer Leslie Gilbert continuously works to think about what she can do to cater to her past clients. She has a process to move clients from wedding photos, to maternity photos, to family portraits, and all points in between. During the initial planning process with her clients, she intentionally places baby albums and family prints in her office. She knows that by doing this, it will help to plant the seed about what her clients may need after the wedding. When her clients see the albums and prints, it helps direct some of the conversations toward the topic of children and future plans. Also, throughout the entire wedding process, she strives to develop a friendship with her clients, making her their go-to photographer for any future photographic needs. When you work to book your ideal clients every time, you have the unique opportunity to create an exclusive group of like-minded clients. As your clients progress through the life stages that come after getting married, it can sometimes be challenging to find other clients who are interested in similar things. When you continue to book clients who have similarities, you can introduce them to one another. For example, during the slower season, host a brunch and invite your past clients to it. This is a simple way for clients to mingle and get to know new people. Along with meeting like-minded clients and potentially forming new friendships, all these clients have one thing in common: you were their photographer. This makes it simple for them to share stories and experiences they had with you, keeping you top of mind. Throughout the process, you likely have sent your wedding clients several emails. These emails could range from how to prepare for the wedding day to the specific wedding day timeline. Even though the wedding day is over, this does not mean your emails and updates have to stop. Similar to sharing information about planning a wedding, send out a weekly or monthly newsletter that discusses what happens after the wedding. Find areas you know can be challenging for newlyweds and things they could use advice on, such as financial planning or even how to stay healthy and workout. Your newsletter can dive into these topics and you can share tips and insights on how to best work through these topics as a newly married couple. Abbey Kyhl, a wedding photographer in Salt Lake City, developed a post-wedding newsletter that keeps her past clients engaged with her. This piece of content goes out exclusively to her past brides and keeps them in the loop indefinitely. She also provides opportunities specifically for past clients, such as family portrait sessions. Typically, Abbey does not shoot portrait sessions, so she makes this an exclusive opportunity for her past clients. This serves to make her clients feel like they are part of an exclusive club. As your wedding clients transition from phase to phase, the way you market to them needs to evolve and grow. Every stage has importance and must be handled a little differently. Creating strong content helps clients to ascend the client referral ladder, moving them from advocates of your business to true believers. Before your clients become past clients, they first have to go through the entire experience with you. To set yourself up for success, here are a few tips to use to turn your clients into loyal fans. Walk your clients through every step of the process the moment they come into contact with you. By actively taking the time to educate your clients clearly from the start, you will build trust and eliminate any uncertainty they may have. Always stay in contact and communicate any changes or updates you have about a particular process. This way, their expectations will be managed throughout their entire journey with you. Anticipate your clients’ problems, questions, and concerns before they reach out about them. Take the first step and reach out to them to address these items as soon as possible. This will show your clients you care about their personal experience and are actively thinking about them. When you eliminate any problems before they happen, it will increase your clients’ overall happiness. As a wedding photographer, remember that you are an expert in all things related to the wedding day. Your clients lean on you for your professional advice, so use your expertise to help them make plans and decisions. By helping them, you can alleviate some of the stress that comes along with planning such a big day. Help them by creating content that will help them through the planning stages. For example, create a customized bridal guide for your newly booked engaged clients. Guides are a resourceful way to answer questions, and they are great tools for your clients to pass along to family and friends. Within the guide, include useful tips and insights on everything leading up to the wedding day that clients may want to know. When clients hire you, send this guide out to them right away. This will immediately help them feel welcomed and excited to work with you. It also shows you care about the entire wedding process, not just the photography aspect on the big day. After your clients book you, connect with them on a consistent basis. Reach out to check on the progress of the wedding planning, and offer advice and help. Remember, this can be a stressful time for clients, so ask yourself, “What can I do to help them?” Communicate that you are available for questions and you understand this can be an overwhelming process. Do you respond faster to people through texting on your phone? If so, consider giving your clients the option to text you if they want to easily reach you. This will also help your clients feel like you are sharing something more personal with them (outside of your business email). When you take time to get to know your clients on a personal level, it can help to convert them into lifelong fans of your business. From your first meeting with each couple, listen to what they share with you and take note of the small details. If a couple mentions one of their favorite restaurants in a conversation, use this information to your advantage. A month before the wedding day, send them a gift card to the restaurant with a personalized note. In the note, share that you wanted them to have a relaxing night out alone in the midst of their busy wedding planning process. If your bride mentions she collects something, such as seashells, try to find one for her that she can add to her collection. Send it to her before the wedding day. Let her know where you found it and how it instantly reminded you of her when you saw it. These gestures will thrill your clients and will show them you pay attention to all the details they share with you. This can help you turn your clients into true fans of you and your business. While it is great to manage expectations and let clients know exactly what they will receive and the timeline for everything, take the extra step to thrill your clients by exceeding their expectations. If you tell clients they will receive their images 4-6 weeks after the wedding, over deliver on this. Outsource images to ShootDotEdit for fast turnaround time, and surprise clients by giving them the photos 2-3 weeks after the wedding. Put in the extra effort to truly thrill clients and provide them with a great experience they will be eager to share with others. Gratitude goes a long way in any business. Show your clients you are thankful for them in unique ways, such as sending handwritten thank you cards on your personal stationery. During the holidays, send holiday cards using ShootDotEdit’s free templates for holiday cards that are customizable and easy to use. Simple gestures go a long way, and clients can share these thoughtful items with their family and friends. Plus, it will encourage them to work with you again in the future. The next step is to take a look a the areas where your past clients came from and create a wedding photography marketing plan to help you expand your reach and maximize your efforts. Take a look at a few of the first touch points your clients could have with you and ways to create marketing. If you find most of your past clients are from social media, this is where the majority of your time should be spent. The next thing to do is to learn which platform your clients are, whether it is Instagram, Facebook, or Pinterest. If you find the majority of your bookings come from clients that found you on Instagram, and you receive higher interaction there, that is the first platform where you will want to create a plan. Share your top photos from past weddings. After you receive your images back from a photo editing service, like ShootDotEdit, share them on social media. These should be the best images you took and are ones that represent your unique photography style. Develop a hashtag strategy. This applies to both Instagram and Facebook (although it’s not as popular on Facebook quite yet). Make sure to use hashtags that relate to your photography business, specialty, and ideal clients. Tag clients and vendors. Tag your clients and vendors that helped during the wedding day. This gives both your clients and vendors the opportunity to talk about you to others and share your images with their followers. Link to your website and blog. A link to your website or blog encourages followers on all social platforms to learn more about you and your services. When you share images from a recent blog post, make sure to include a call to action that invites your followers to see the rest of the images and story on your blog. If you decide that most of your past bookings come from clients finding your website or blog on search engines, create a marketing strategy focused on how to increase your presence. Using Search Engine Optimization techniques on your website and blog are key to grabbing the attention of search engines. It also helps you have your website and blog posts rank higher. Build links for SEO. Start with your social media platforms when you build links. Make sure they link back to your website or blog. Use call to actions to encourage clicks on the links so clients can learn more about you and your services. Be specific with keywords. Use keywords that are specific to your specialty for your website, images, and blog. Also, use ones that help you target your ideal clients as they search for a photographer. The more specific you are, the easier it becomes to use keywords your clients often use on search engines. Share blog posts regularly. Blog posts are a quick way to add links for SEO to help you rank on search engines. Adding keywords to your blog posts and images is essential to your success. A blogging service for professional wedding photographers, such as Fotoskribe, can implement proper SEO strategies and more for your blog posts. When you know where your clients come from, you can create a strategic wedding photography marketing plan for your business that helps you book more weddings. What are additional strategies you can use to attract and book clients for your photography business? Click the banner below to download our free Guide to Marketing for Wedding Photographers to discover advanced tips and tricks from wedding pros you can implement today!